The moment a passenger train drove through Sydney's bushfire was caught on camera, as more than 1,000 hectares in the city's south-west went up in smoke yesterday. At one point, flames and spot fires can be seen close to the carriages, as a commuter says: "It's jumped the line already." The video was posted on social media during the height of the blaze, which affected several suburbs around Holsworthy and Menai. Part of the line was later closed. "Busses are replacing trains between East Hills and Glenfield on the T8 Airport and South Line, due to a grass fire at Casula," Sydney Trains said in a statement. "Sydney Trains has been liaising with emergency services throughout the incident and immediately shut the line when it was deemed unsafe by Fire and Rescue NSW." The inner-west and Leppington line, and the Bankstown line also experienced delays as a result of the disruption at Holsworthy. Hot and windy conditions did not help efforts to curtail the blaze, which at various stages included water bombers, more than 140 firefighters and a 4-kilometre-long line of trucks. The Harbour City is experiencing an unseasonably warm Autumn, with Sydney setting a new April temperature record on Monday and the mercury passing 31 degrees Celsius in the city's south-west yesterday. 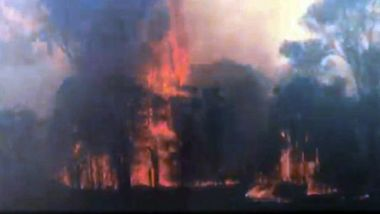 The New South Wales Rural Fire Service (RFS) is investigating how the blaze started. 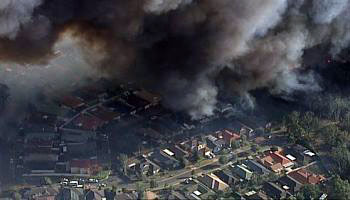 It began around Moorebank and burnt in a south-easterly direction through the Holsworthy army base and dense bushland before eventually reaching residential areas again. At one stage, the fire surrounded the munitions store at the base, which was successfully protected.